This bi-annual conference provides rural preceptors the opportunity to receive preceptor development and continuing education credits, and to build linkages with community partners. 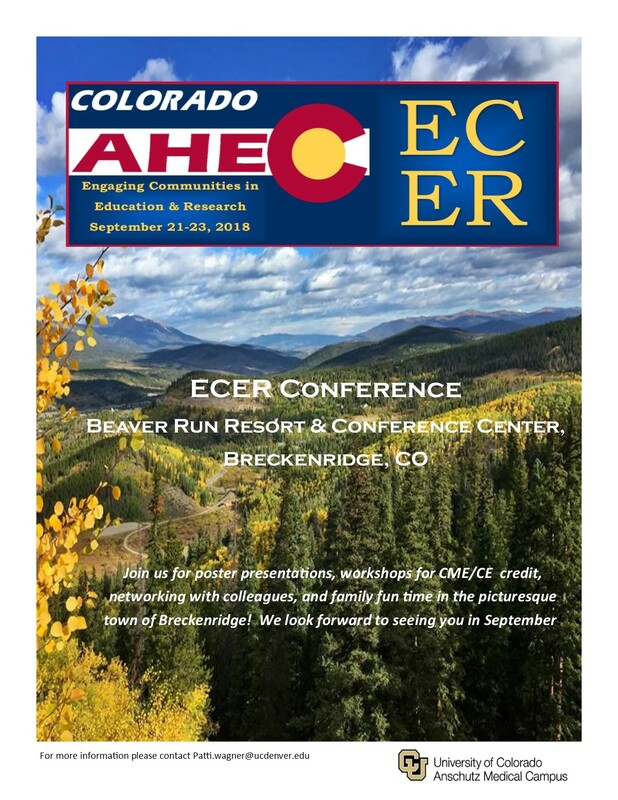 The next conference is scheduled for September 21-23, 2018, in beautiful Breckenridge, CO. The Engaging Communities in Education and Research Conference is about engagement, a concept that shapes the structure and operations of the relationship between the community and higher education. Using the word “engagement” rather than “outreach” or “service” has expanded our thinking about the community and higher education relationship. Universities must respond to the needs and changes in society in order to remain relevant to the communities that support them. Leading this effort between the University of Colorado Anschutz Medical Campus and local communities is the Colorado AHEC System. Established in 1977 to recruit, retain and educate health care professionals in rural areas, the Colorado AHEC System’s mandate has been expanded by the federal government and the University to be the outreach arm of academia. The scope of this relationship has increased to include preceptor development, student service learning projects, research, clinical services and a host of other undertakings. The success of our mission is dependent on the communities we serve. We are very pleased and honored to have Victor Montori as our Keynote speaker on Saturday “Why We Revolt: for careful and kind care for all”. You can download is bio and read more about this presentation here Victor Montori.pdf.